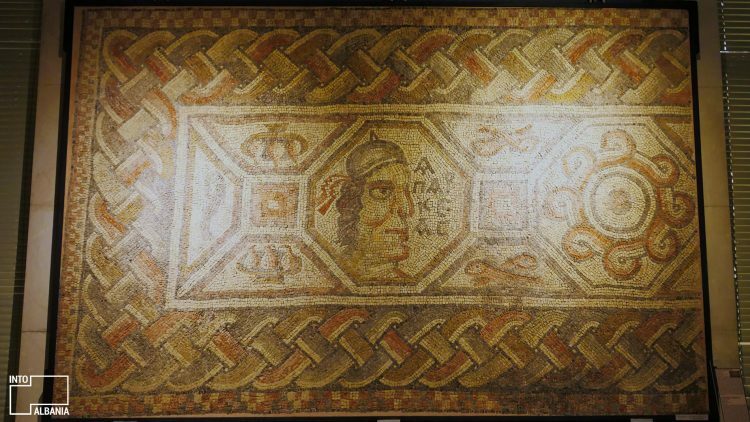 One of the most fascinating mosaics in Albania, the 6th century Mosaic of Mesaplik located in the National Historical Museum, raises multiple questions regarding the portrait of an unidentified person and mysterious inscription. No one can know how archeologist Damian Komata felt in 1979, when he uncovered the forgotten Mosaic of Mesaplik among the ruins of an abandoned Paleo Christian church. The discovery occurred in Mesaplik, Vlora, in a place known as the Church’s Shore (Bregu i Kishës). The mosaic is created on a layer of concrete, the latter constructed via a Roman technique which combined limestone and brick dust. The cubic stones of multicolored specters, each measuring at 1-1.5 cm, depict figures of birds, fish, flowers and fruits, creating a wonderful complete mosaic with a height of 230 cm and width of 249 cm. At the center of the mosaic lies the figure of a man with a pointy hood and two ribbons flowing to the left of the man’s head. The inscription APARKEAS is to his right. All the letters of the engraving, but one, belong to the Latin alphabet with the letter “P” written in Greek. Throughout the years, many scholars have tried to answer questions about the man’s identity as well as the meaning behind the inscription. Though they still remain unclear, the information below sheds some light on this mysterious mosaic. Mosaic of Mesaplik, photo by IntoAlbania. The first answer comes from the 1985 edition of the Albanian Encyclopedic Dictionary, which poses that the word “aparkeas” indicates “northern wind” in ancient Greek. To support this theory, researcher Dhorka Dhamo confirms that the mosaic’s head is positioned toward the north with the ribbons flowing in the wind. However, subsequent scholars have argued that, in ancient Greek, the word for northern wind was spelled aparktias or aparkias, but not aparkeas, as it appears on the mosaic. Another theory, offered by scholar Niko Stillo, claims that the engraving is written in Albanian and it says “A PAK KE T’AÇ,” (Eat little, you have enough). According to Stillo, the figure portrayed in the mosaic is that of a monk, who predicates a simple way of living. This theory has also been accepted by several other scholars who claim that the hood on the figure’s head indicates his status as a monk. The latest theory regarding this cryptic figure and inscription comes from the scholar Etnor Canaj, according to which the iconic portrait is that of the emperor Justinian. The above theories are only some of many regarding this enigmatic mosaic, whose central figure and inscription make it one of the most mysterious and sought-after mosaics in the country.